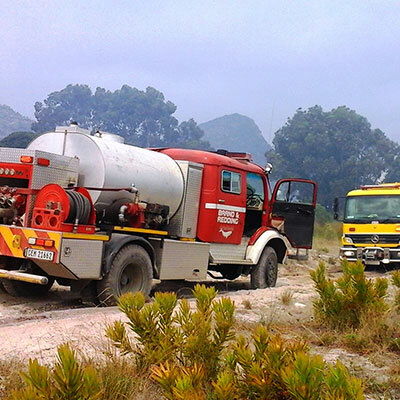 Landowners in the Overberg are encouraged to prepare themselves for the up and coming fire season. There are many actions landowners can take already, with support available from the Greater Overberg Fire Protection Association (goFPA). According to Louise Wessels, Manager of the goFPA, most of the work to prepare for wildfires takes place long before the fire season starts. She says landowners should use past fire seasons to guide their actions – to understand where their high-risk areas are, and to ensure firebreaks are in place. Control burns also help to reduce fuel loads during periods of cooler weather. Now is also the time to ensure administrative tasks are completed. For example, landowners are encouraged to sign firebreak agreements with neighbours. It’s also a good time to ensure insurance schedules are up to date and correct. She says certain fire-fighting equipment is needed at a fire. Farmers and workers are encouraged to have leather boots and gloves when fighting fire. These and other protective equipment should be acquired before the season starts. The goFPA has developed a supporting document guiding members on how to prepare themselves, as well as a preparation checklist. This and other info is available on the goFPA’s new website: www.overbergfpa.co.za.